This post is intended as a resource and a start of a discussion for those that manage Corporate Customer Reference Programs, please forward this post to the right person in your company. This is an important intersection that required some light in a recent Customer Reference conference. Social Media (Blogs, forums, podcasts, social networks and other tools) impact nearly every arena of the corporate organization. I’m not part of the Word of Mouth organization, nor part of the Customer Reference industry, but I am a Social Media consultant looking in. Nielsen Buzz Metrics research indicates that consumers trust other consumers above all others. Other research leans towards word of mouth. Prospects value the opinion of a customer over that of the vendor. As a result of the value of network based customer opinions, Customer Reference programs were born to the corporate enterprise. Having managed or helped to lead four Enterprise Intranets at large corporations over my web career, I know that deliverables from a Customer Reference program is an invaluable to the Sales Cycle. The Customer Reference Program Manager is responsible to build a library of examples of how customers have deployed their products across different industries or environments. Often, they obtain these references by providing bonus services to customers, beta testing products or other incentives. Sometimes, sales teams are required to obtain customer references before a compensation check is issued to account teams. These important references are captured, organized, and republished (from PDF, video interview, a phone reference etc). Many corporate websites make excellent use of these references, here’s a few great examples from EMC, IBM customer videos, Microsoft, SAP Webcasts, and Hitachi Data Systems. It’s possible to quantify the actual return from customer reference programs. The examples above are a good indicator of the path of least resistance for a prospect to find a detailed customer reference was from the corporate vendor. It’s widely known that Customer Reference Programs often filter, adjust, and select the content for the benefit of the company. Now with easy-to-publish web tools such as blogs, forums, rating site, and social networks, individuals can openly and honestly provide opinions, thoughts and engage in discussions. I, and others like me, do this frequently for products we use. The barriers to entry are internet access and basic tool knowledge. Social Media empowers anyone to publish their voice and to be easily heard, for negative customer feedback this is a disruption and opportunity, for positive customer feedback, this is an opportunity. Future generations of workers and decision makers primarily rely on their social networks to communicate, known as the tivo generation, digitally native, and myspace generation. 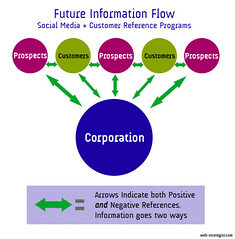 Customers and talk directly to prospects bypassing a corporations, marketing and customer reference programs. 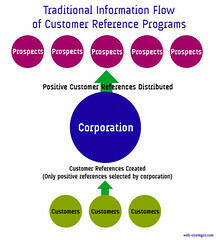 Content from customer reference programs (like other Marketing materials) gloss the company in a positive light. When a prospect is evaluating an important decision (such as a tool that could impact their career) they are expected to obtain information to make a logical business decision. 2) Customers can easily publish their customer experiences on Social Media tools. While an overused example, at one point, Jeremy Zawodny’s post complaining about Dell Support was displayed higher on the Google search results than the actual Dell Support page. (it’s now lower on the results page) Be sure to read the many comments of folks that offered their opinion. Both of these examples are disruptive to how traditional customer references were captured and share, the first being a positive mention, the second being negative. Here’s some examples of how prospects can easily find opinions of customers using Social Media tools, please note, some of these are as old as the Internet. Social/Network Ratings: CNET is one of the early adopters when it comes to customer ratings and reviews. Also see epinions, yelp, and other sites. Tools such as Technorati, TalkDigger, Sphere, and Google Blog Search. In many companies, a “Community Manager” role or “Social or Digital Media Manager” is starting to appear as a result of the customers talking to each other and talking back. As a Customer Reference Manager you should align with them. If your company has yet to recognize the impact of these tools on your company and brand, see this post on Corporate Blog Evangelism. Learn how to use Technorati, Google Alerts, apply them to your company name, specific product name, executives. Teach Product teams and support to do the same. There’s a lot to learn from the Church of the Customer blog. Customers that praise your products from websites and blogs will make natural candidates for your customer reference database. Reach out to them, and ask them if they’d like to participate. Of course, as you tell prospect about their opinion, you’ll want to indicate that they willingly and voluntarily provided this feedback without your coaching or being incented. Give consideration to using negative customers opinions to win a customer for life. If you reference customers with blogs, they are already public information, so the process in getting customer feedback is that much faster. If you’ve already established a corporate blogging program at your company, encourage your bloggers to link to the positive references of your customers, as well as learn to deal with the negative ones. Now that you’ve started to understand how to listen, your company will need to figure out how to respond to raw customer opinions. The worst thing to do is to listen and do nothing. (See what happened to Dell) Learn how to turn negative feedback about your company into a positive. There’s been cases where a customer having problems with a product will publicly blog about it, the company will respond and fix it and the customer will become a brand advocate and defender. This art is a bigger discussion, but I suggest starting with the book Naked Conversations. Anti-Marketing Marketing emerges. At Microsoft, Robert Scoble (now my colleague) was hired as a technical evangelist for Microsoft products. He became a living customer reference program by linking to bloggers who said positive and negative things about Microsoft. By leveraging both the good and bad feedback from real customers he became a trusted source to find customer and market opinions about Microsoft. Create an internal blog at your company that references all the instances of customers talking about your products in public forums, blogs, podcasts, social sites etc. I recommend attending a conference by the Blog Business Summit, New Comm Forum, or Word of Mouth Association. Create this an external blog and link to all customer references on blogs, forums or in podcasts in your industry. To build the most audience trust, both negative and positive. If you work at a company with a passion community, it’s likely some customers may have already done this. You’ll be able to save yourself some time by referencing public blog posts (perhaps from your own blog) which could reduce the time to getting customer permission. In some cases, public recognition is incentive for these natural references. Here’s an interesting outcome of a small customer getting the CEO of Sun Microsystems to listen and respond. That lets real customers provide their best practice information, real feedback, and rants and raves about your products. Consider involving your practice groups. For many companies this is a safe approach as you can control which passion customers will be selected to attend this session. Here’s some interesting ways to generate buzz for your program, both internally and externally. Customer References shouldn’t be limited to PDF or Audio. Video is a great way to convey the human emotion and display a deeper connection. There will be an overlap between the Customer Reference Program and Community/Social media programs at many corporations over the next year. 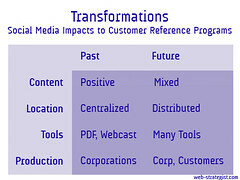 Customer Reference Programs will use Social Media tools to find customer opinions. Effective Customer Reference programs will integrate negative comments and opinions into it’s program for great trust and authenticity with the market. Customer Reference Programs will use Social Media tools to help tell the stories. Some companies will benefit from the interactive benefits of these tools. This post stemmed from a discussion with a PodTech client (see right nav for list of clients) whom I serve as a Social Media consultant. I frequently use this blog as a resource for our customers as well as be a resource to the network. I would be interested in sharing additional information at a Customer Reference conference, you can learn more about me on my profile.